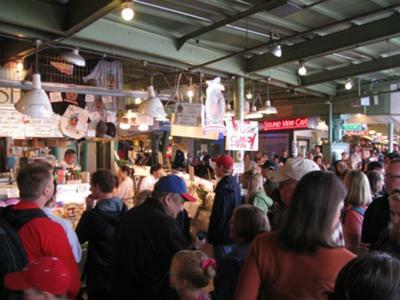 One of the places we love to take our kids to is the Pike Place Fish market. Pike Place itself is a really cool place to walk around, but gathering with the giant crowd that is always crowded around the fish guys at the end of the market is awesome. I had seen videos of them before I went for the first time and it was cool to see them up close and in person, and then take my kids to see them throw the fish and yell out the orders. I even had to buy a fish market hat from them the last time I was there. Join in and write your own page! It's easy to do. How? Simply click here to return to seattle attractions.